1. Despite my massive fear of flying (actually, the phobia is more so the fear of NOT flying, or rather, plummeting from 35,000 feet cruising altitude to the ground – WHEW – my pulse races thinking about it. Ugh. 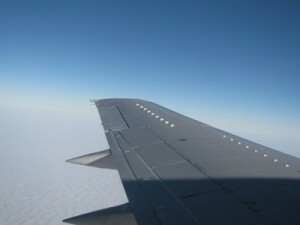 So yeah, anyway…), I boarded a plane yesterday bound for Nashville to attend the Blissdom conference. There are a lot of amazing workshops and seminars this weekend – but I tell you, I’m STOKED for today’s photography workshop with the amazing Mishi. She takes phenomenal photos and if she can tell me what some of these buttons on my camera mean, I’m gonna be over the moon happy. I’m HERE, y’all. 2. Doesn’t my “y’all” seem more authentic when you know I’m actually in the south? 3. It was hard for me to leave my family at home. 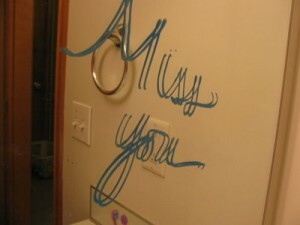 I left notes for them written (on the girls’ dirty bathroom mirror) with Crayola Window Crayons*. I’ve written a few notes for them to find while I’m gone. 4. Proving that I am nothing if not supremely coordinated and graceful, last night while walking through the hotel I walked right into a brick bench. A NON MOVING BRICK BENCH. The sucker didn’t jump out in front of me – I was just so distracted looking at stuff. Grace, I haz it. I also have a pretty banged up knee now. 5. Project Runway last week. BOY WAS I WRONG. I was so sure they wouldn’t send crazy Ping home so early – but I suppose they ran out of reasons to justify her being there. I may have done a little bit of a dance when she got auf’d. 6. Did you watch “Lost” the other night? I never realized just how many people DO watch this show until the other day when that’s pretty much all anyone was talking about. I’ve seen about fifteen minutes of the show. Total. Fifteen minutes from the very first episode. Never watched it again. 7. I have been awake since 3 a.m. so it’s fair to say that in a few hours, I will be curled up in the fetal position sucking my thumb somewhere. Or on my tenth cup of coffee and ready to run sprints. Time will tell. 8. Last week, my brakes started making this horrible noise. It wasn’t just the squealy noise that tells you your brakes are done, but this groan-y, grind-y noise. We ended up taking it to a mechanic over the weekend. The dude said, “Check back in two hours.” Two hours later, he STILL hadn’t looked at our car. It wasn’t until FIVE hours later that we were on our way, several hundred dollars lighter (dagnabbit). The worst part – worse even than the cost to repair the brakes – is that while we were waiting, our whole family was at the mall. Five hours at the mall. Imagine that. 9. Last night, I was walking with a friend of mine through the hotel and we passed a burger restaurant. I realized that I haven’t had a hamburger in Y E A R S. Like, probably over ten years. I don’t miss them. It wasn’t a conscious decision – I’m not a vegetarian. I just never really think to myself, “Oooh, hamburgers.” Ever. Weird, right? 10. Did y’all watch the Grammy’s last weekend? What did you think? After about an hour, I was tired of it (actually, my patience was officially gone when Beyonce covered Alanis Morisette). I used to pride myself on being pretty current with music – but now? I’m not. I hate that. *Crayola pays me nothing to say anything about their stuff. Hell, I even bought my own crayons. I just really dig these Window Crayons, as do my kids.